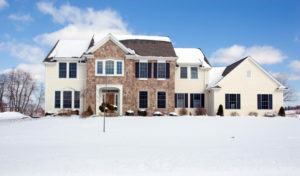 Snow and Ice Safety Around the Home - Columbia Builders, Inc. Snow and ice safety is incredibly important for your safety as well as the safety of loved ones and guests. Make sure to follow these tips. Snow-filled landscapes are an absolutely beautiful part of our winter season, especially when viewed from the warmth of your new custom home (preferably in front of the fireplace with a mug of cocoa!). Stunning scenery aside, it’s important reduce the risk of accidents and falls around your home’s exterior by properly preparing and maintaining sidewalks, driveways, porches and railings. Treacherous conditions can happen quickly! With the safety of your family and guests in mind, here are a few tips for making sure that the snow and ice around your home this winter doesn’t become a hazard. Long before winter sets in, make sure you have what you need on hand. Waiting for a storm in the forecast is not the time to search stores for shovels, blowers, ice melt and other winter supplies. It is still not too late to take stock of your supplies, and if you own a snow blower, make sure it is in working order. Other things to check on around the exterior of your home include inspecting your roof and gutters to be sure they are clear of any obstructions that could result in snow buildup. Your downspouts should also be angled so as to not direct water across your driveway or walkways, which helps prevent future refreezing. Lastly, make sure your exterior walkways are well light. When the flakes begin to fly, don’t let snow accumulate and sit – once people walk or drive over snow, it compacts. Compacted snow can quickly become ice during a sunny day/cold night melt and refreeze cycle, making for icy, slippery conditions. Plus, it’s much harder to remove! Reduce the risk of all injuries by using a snow shovel or snow blower to remove fallen snow as soon as you can after a storm. Pay careful attention to steps. It may be tempting to use ice melt products, and free yourself of some of the labor of snow removal, but many cause damage to your hardscape and landscape. From chipped concrete to damaged plants, these products can often do more harm than good, particularly if you have pets. Some products are toxic, so look for one specifically labeled as safe for pets. Try to limit your use, follow the manufacturer’s instructions, and stick to the basics like snow shoveling to reduce how much you need to use salt-based melting products. Avoid melting products altogether by putting down natural products that give traction – sand, wood chips, gravel, and even straw – if stubborn ice and snow remain after your best efforts to remove them. Design and Build Your Dream Home with Columbia Builders! This entry was posted on Friday, January 25th, 2019 at 2:09 pm. Both comments and pings are currently closed.